LONDON — In his irritation at losing to Tottenham last month, Maurizio Sarri challenged an offside ruling by producing evidence from Chelsea's own camera angles. Lines were drawn across the footage, which was produced during the post-match interview to cast doubt on the official video assistant referee ruling on Harry Kane's winner in the English League Cup semifinal first leg. The offside markings were rudimentary and disputed by the refereeing body. 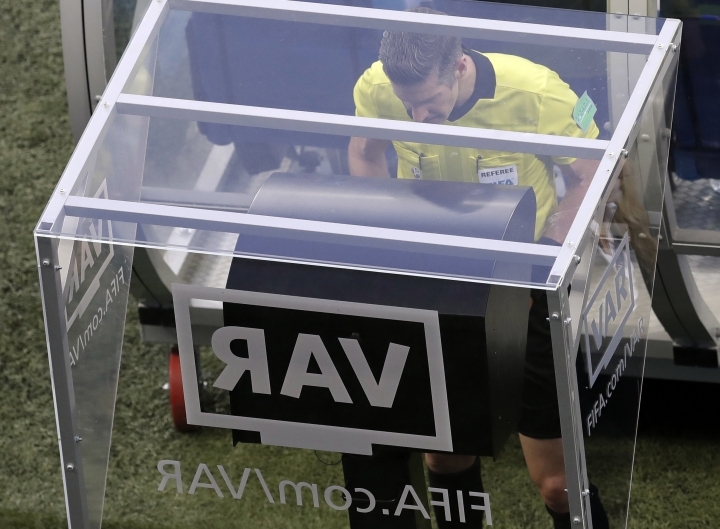 Now, even more technology will be at the disposal of some clubs — and fans — from next month, before VAR's debut in the Premier League next season. Arsenal, Liverpool, and Manchester City have signed deals with Intel to bring its True View system to stadiums. Using 38 5K ultra-high-definition cameras, with no link to the main broadcast feeds using the VARs, 360-degree replays will be recreated from any angle. Intel says the video recreations of incidents will give pundits and fans a new "insight into the tactics and decisions made by players." Inevitably, those by referees, too. The Premier League hopes footage won't be used retrospectively to challenge their decisions, especially as the system isn't calibrated for refereeing purposes. Intel's True View allows a moment in a game to be frozen to view in 3D from the eyes of anyone on the pitch, and a virtual wall can be inserted to make it clear where players are positioned. "The key element is allowing our fans to step into the shoes of their favorite players or their favorite pieces of action and engage with that content," Silverstone said.